For most musicians, having a platform to showcase your music is enough. However, for those who wish to create something more for their audience, a website is a great idea to start with. There are some forms of content that you cannot share with your audience if you use Facebook pages, Spotify accounts, and other sharing platforms on the internet. Aside from this kind of setback, performers who wish to create a more professional setting for their performance gigs will not be able to use such platforms unless they use a website to put their works in. If you are a music band who is still starting out and don’t wish to buy a domain website from other website vendors, WordPress is a great choice to help you create your website. Not only does WordPress host different forms of media for your website that you choose to set up with them, you can also get all the perks of getting your own website without having to pay a hefty price just to get the rights to the name of your website. However, building a website will not be easy, even if you use WordPress alone. This kind of job is usually suited to people with such knowledge, and those working in the music industry just like you will definitely have limited knowledge, if you have any at all. This will not be enough for you to create the website you wish to make to attract fans and clients, especially if you are going for a more professional route. There is a solution to this, however, because WordPress allows users to use themes that you can use without having to know any extensive knowledge from website making. Such an example that is suitable for users like you are music band WordPress themes. They are themes that you will be able to use that will help you showcase your content that is based on your industry of work, which is music and entertainment. These themes can help you link your content from other platforms such as social media websites and music websites that you already have an account with. Not only that, you can also upload different content that you cannot share with users on those platforms. These themes will only need a copy of your content to be uploaded to the website to be seen by viewers. These themes will allow you to create your website just as easily as working with a social media profile. There are also different designs that are available for every type of musician and music band that belong to various genres. Some of these themes may be able to cater to various genres, or may focus on a more generic approach. 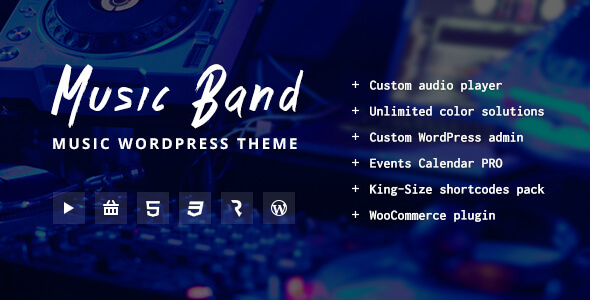 Thus, we have picked different kinds of music band WordPress themes for you to take a look at so that you can select the best theme with the appropriate features for your music style. Read below to find out more about these WordPress themes. Mozo is a theme that has a 5 out of 5 stars rating based on users who have reviewed them based on its great design quality and excellent customer support. It is a theme that delivers a modern flare to the website which is versatile for most kinds of music bands and musicians. One of the best features of Mozo is that it has a premium image stock that you can use for free without having to buy any additional licenses. Some of the plugins that the theme has included for free are the following: Slider Revolution, Cube Portfolio, WP101 Video Tutorials, and Premium Icons. The combination of these plugins allow you to create a niche music website that you can create by dragging and dropping elements to your website. You can also see your website come to life immediately because of its Live Editing feature using the WordPress Customizer. DJ Rainflow also has a perfect 5 out of 5 stars rating based on reviews on its design quality and its ability to work quickly on WordPress websites. 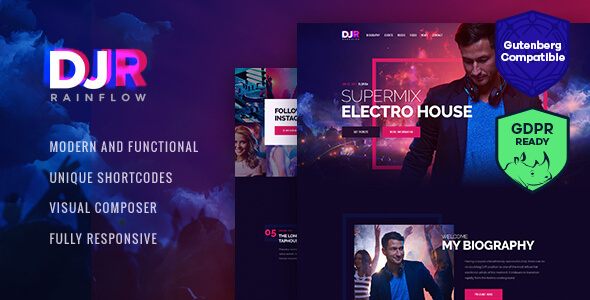 This theme focuses on a modern look made for DJs and music bands that delve in modern music genres. Some of the plugins that the theme has are GDPR Framework WP, Slider Revolution, and Swiper Slider. There are advanced blog settings that you can benefit from using this theme, such as adding Related Posts section as an option in viewing posts, allowing post likes, views, and sharing to other pages and platforms. Unlike other themes, you can make custom post types here. 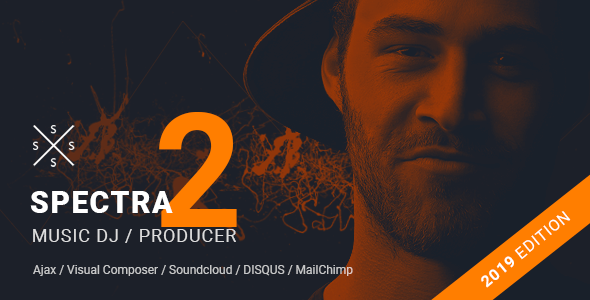 Just like other themes for other WordPress website themes, DJ Rainflow allows you to use various custom shortcodes to make adjustments to your website easier and comes with custom widget sets to make thing easier for your viewers to navigate. Noisa has a rating of 4.71 out of 5 stars due to its great design quality and features, though some users encounter minor bugs sometimes. Just like most kinds of WordPress themes, this uses great plugins like Visual Composer and Slider Revolution to help you showcase your content in a beautiful way. The most unique feature that Noisa has to offer is its ability to allow your music to be played in the background using AJAX, all while browsing multiple pages. AJAX also helps your pages be loaded faster than when using other lines of programming codes. 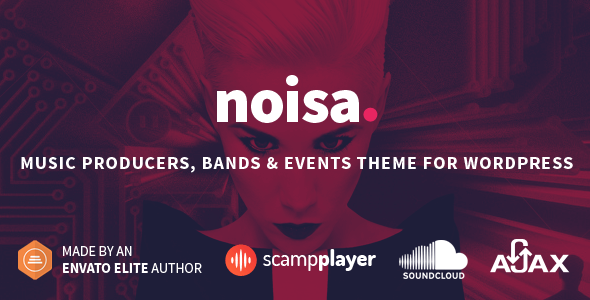 Scamplayer allows your SoundCloud and HearThis.at tracks to be played on your website along with other widgets that can add ease of navigation to those who wish to view single or multiple tracks, or even browse albums. To help boost interactions between users, you can also add DISCUS to allow comments in posts. Due to some minor bugs on the documentation quality for some users, Hugo has been rated 4.16 out of 5 stars. However, Hugo is still mainly praised due to its attractive design. Using plugins such as Visual Composer and Master Slider, its general theme feel is reminiscent of Apple iTunes pages that some people might find appealing. There are different theme colors to choose from, such as Light, Dark, Classical, Formal, and more to help you tailor your theme to the genre that your music band plays. To help your viewers see the beauty of your album pictures and other posts that require crisp pixels, Bootstrap 3 has been included in the package. 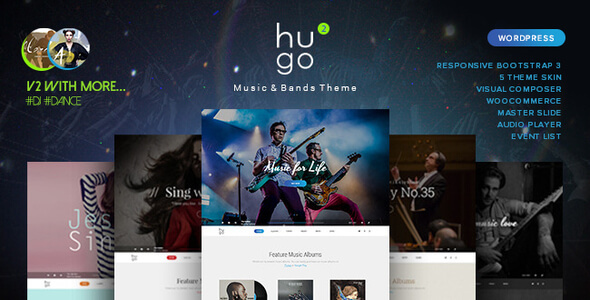 Unlike other music players that are coupled with music band WordPress themes, Hugo can offer you the opportunity to mix up your songs in your library and create custom playlists using a custom player of your choosing. Unlike other music band themes that are rated lowly due to having bug issues, Music Band is rated 4.73 out of 5 stars due to their helpful customer support who are more than willing to help you in fixing problems if you encounter any. 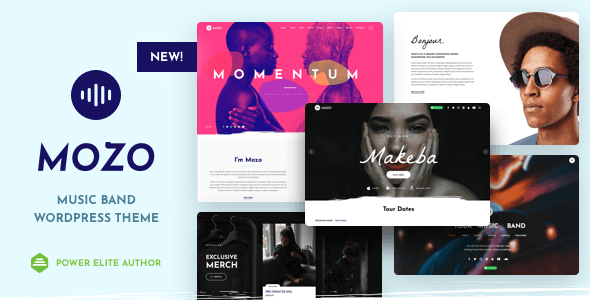 Some of the plugins that are already included in the theme are Layer Slider and Revolution Slider, which allows you to drag and drop elements to places you desire. This theme allows you to create custom forms using its builder tool instead of having to rely on a third party plugin. Along with custom shortcodes and custom post types, you will be able to create a more unique website than using plugins of any sort to customize your website. Music Band is also Retina Ready, so that you no longer have to worry about your website looking dull and outdated when it hits wide sharp screens. 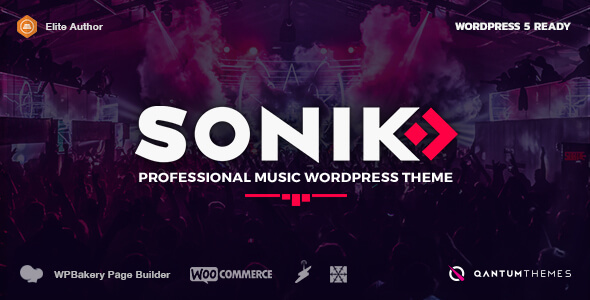 SONIK – Music WordPress Theme for Djs, Singers, Clubs and Labels. SONIK also has a highly received rating based on its reviews regarding customizability and features that are always available to use to update websites. This theme carries a modern theme with 4 demos that are ready to import for commercial use. Plugins that are included are QT Places, Page Composer, and QT GridStacks. listen to your radio streams, you can simply link them using custom shortcodes and make templates for each stream that you want them to listen to, and make profiles for band members. Kentha has a perfect rating of 5 out of 5 stars due to its unique designs and great features that get better with every update. 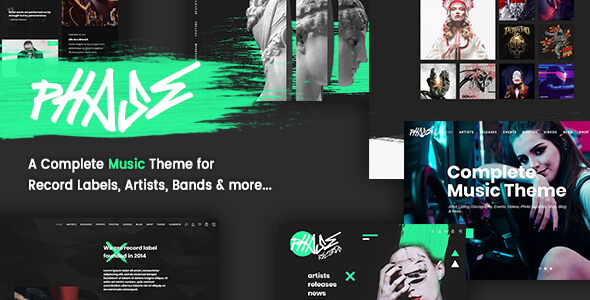 Unlike other music band WordPress theme out there, this also has a more futuristic design that is suited to music bands that align with the EDM industry, which most music band themes don’t offer. The theme offers WooCommerce and WP Bakery Page Builder as the plugins that are included in the package. 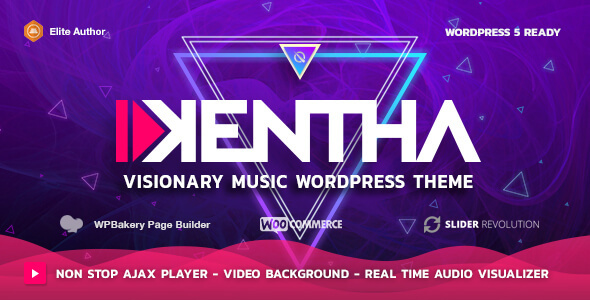 Despite that, it offers tons of features such as Kentha Player, which is a real time music visualizer that also allows continuous music play in the background. For those who wish to use their music videos in the background, YouTube videos are also supported and allow fade-out scrolling for transitioning between content. There are also three different menu designs for you to choose from, so you can choose to include videos or not. 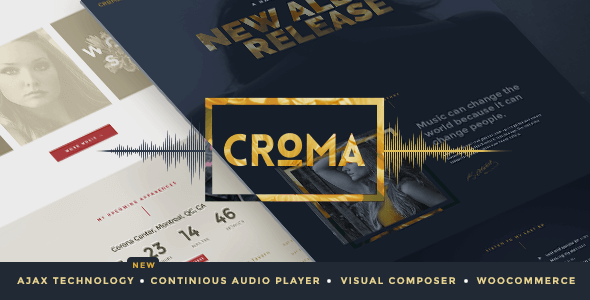 Croma also comes off as a great music band WordPress theme because of its rating of 4.81 out of 5 stars, mainly because it is greatly flexible and offers vast customization options. There are three bundled plugins that will help you save more money when you buy this theme, which are Visual Composer, Essential Grid, and Slider Revolution. If you wish for your viewers to listen to your song and album tracks while browsing other pages, this theme is sure to make the music keep playing until it reaches the last track in your online collection. They are also free to look at your event gigs and tours, view your contact information, and connect to your social media platforms while scrolling through your pages. Another unique feature that this theme offers is Hot Links, which helps ease navigation between your website pages without having to look at any weird menus. this theme are WP Bakery Page Builder and Slider Revolution. Despite having only two plugins, they offer various kinds of demos for you to use and customize to your liking. The theme customizer that is powered by these plugins will allow for endless color possibilities and make different header options available to you as well. Instead of having to upload your content to make your music stream, you can simply link your music platform accounts to make your playlists and showcase your content without having to spend more effort in doing so. Mailchimp’s built in subscription form will allow your new fans to subscribe to your content to get the latest updates to your albums, songs, and events. Phase also has a 5 out of 5 stars rating because of its reviews that deem its design quality as great and being highly flexible particularly to experienced WordPress developers. A tailored WP Bakery Page Builder and Slider Revolution plugin are included in the theme. Phase also supports embed players from various music platforms such as Spotify, SoundCloud, Bandcamp, and others. If you have various discographies with other artists or music bands, you can organize them using various layout options that you like. There are also multiple layout options for single tracks so that your viewers can see your single tracks better. Video posts are also an option in case you want to upload any video content to your page. There is also a wish list option for your viewers who wish to purchase songs and other merchandise on your website so they can purchase your items at a later date. MusicPlay has a rating of 4.69 out of 5 stars because of its great customizability despite having some minor issue with bugs. For third party sliders, Custom Sliders are an available option that is included in the theme. 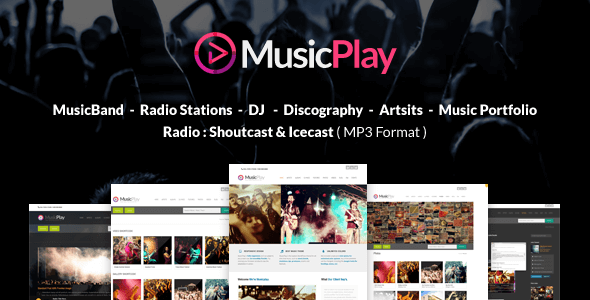 Its main feature, DJMIX, offers you the opportunity to upload mp3 files and display them using short codes. MusicPlay allows you to customize the site and add features to various pages that you can include or exclude along with colors and fonts from Google Web Fonts. Spectra has a great rating of 4.80 out of 5 stars because of great design quality and helpful customer support, though some features are not too customizable. Some of the plugins that you can get are Visual Composer Page Builder and Mailchimp to help create a great website with useful marketing tools that your audience will be enticed to subscribe to. AJAX helps create a faster page load time and at the same time run your music in the background as you view other pages in your browser to help create a better experience. Scamp Music Player helps your web pages load faster even if you are using a music player because it is lightweight so it does not require a huge amount of download time to load properly. The header can be customized to include videos, sliders, images, or maps depending on what you want to put in the header. 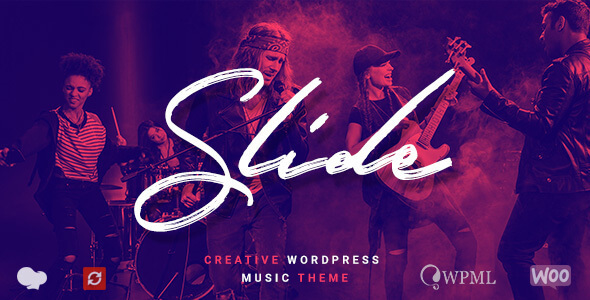 Most of these music band WordPress themes are not your ordinary theme since they offer so much opportunities for you to showcase your music along with other merchandise that you may like to sell, aside from updates to your gig and tours. Depending on your musical journey, you may choose to add or remove whatever content you wish to include in the website. These themes will definitely help boost your career and make it a great experience for you and your fans. In the end, it will be up to you on how you will make it work.